Catania is nestled at the foot of Mt Etna on Sicily’s north eastern coast. 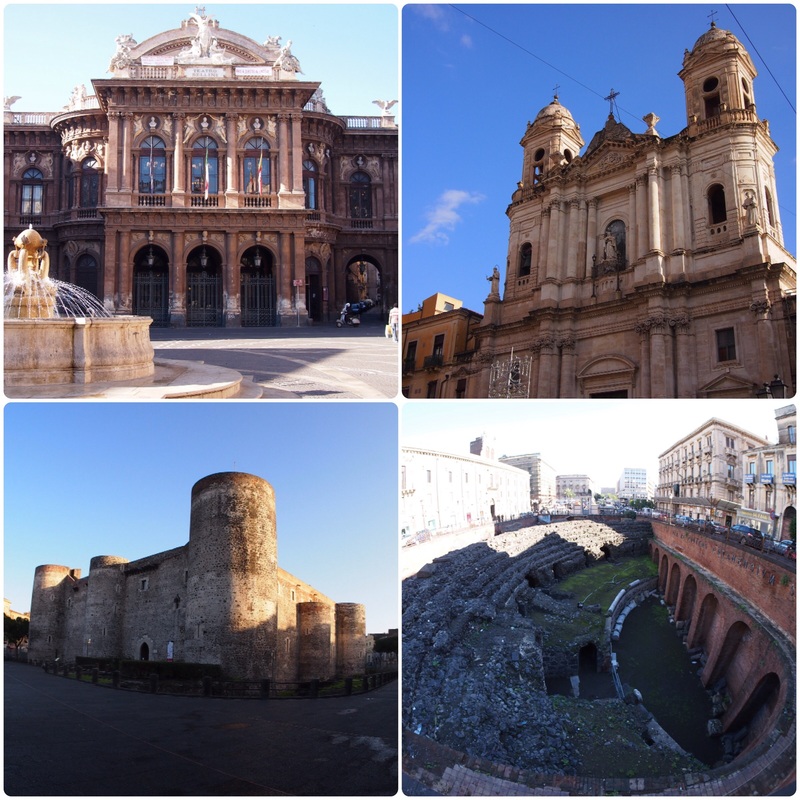 It was our first stop on our circuit of Sicily, the ball to Italy’s boot, and is the island’s second largest city. Although it’s a decent size, with a population of around 300,000, we found the centre to be compact with all of the sights within easy walking distance of each other. 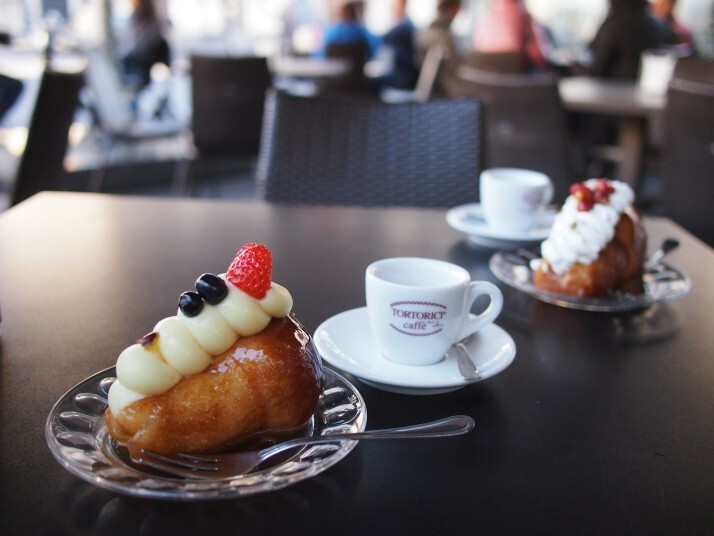 In the centre of the city is the Piazza del Duomo (Cathedral Square) where we started our visit with a spot of people watching and a humongous (and very alcoholic) rum baba at one of the square’s pavement cafes. 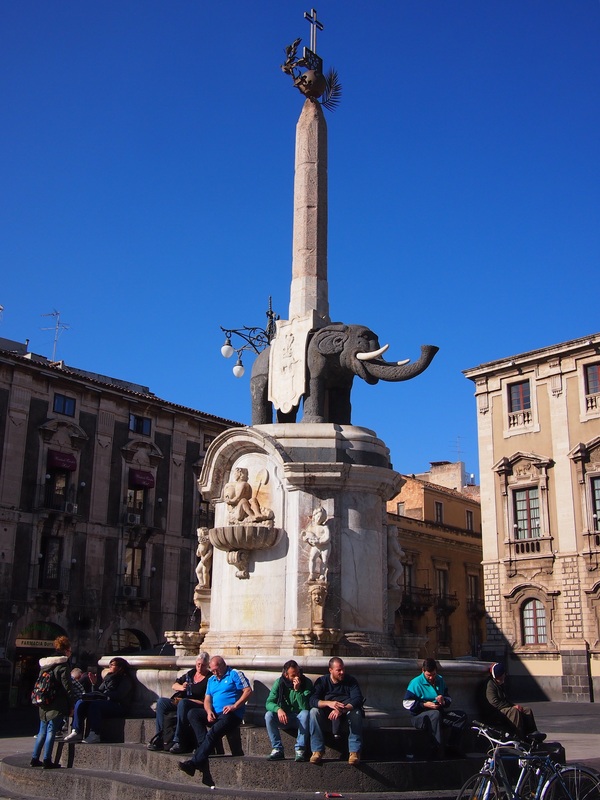 The focal point of the Piazza is a monument consisting of the rather unlikely combination of an Egyptian obelisk and a happy-looking elephant carved from lava stone. It was assembled in 1736 by Giovanni Battista Vaccarini although its origins are unclear and both the elephant and the obelisk predate the assembly by many centuries. It now serves as the emblem of the city. 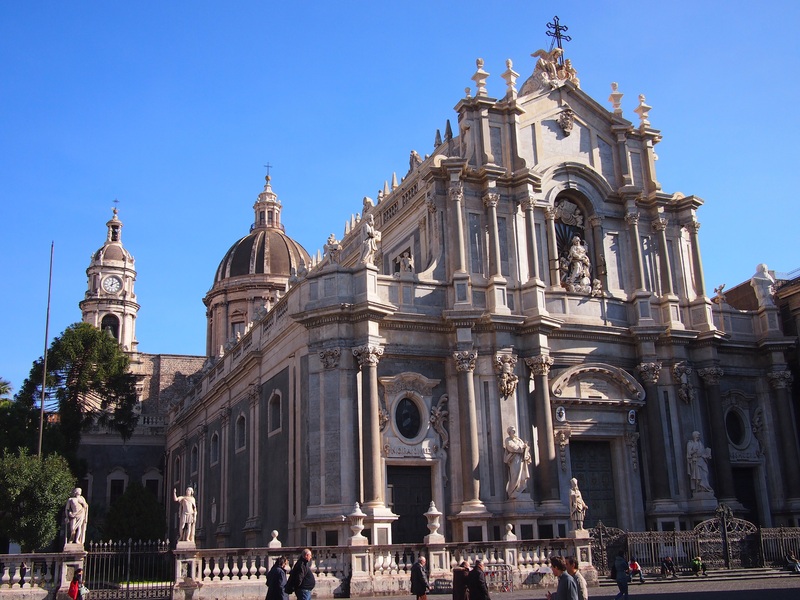 Along the eastern edge of the Piazza is the city’s cathedral, or Duomo, dedicated to St Agatha who was born in Catania in 231AD. The inside is quite plain but nevertheless grand and imposing. In the middle of our visit, music started playing and a soloist began singing beautifully, it turned out to be a service in one of the side chapels, adding a lovely atmosphere. One of the things we were looking forward to in Italy was the world famous food and I was hoping that the markets would be a vibrant place to explore. Catania has two daily markets in the central area and both were great places to look and photograph as well as to shop for provisions. It was easy to tell what was in season with piles of fennel, purple cauliflowers and citrus fruits dominating the scene. 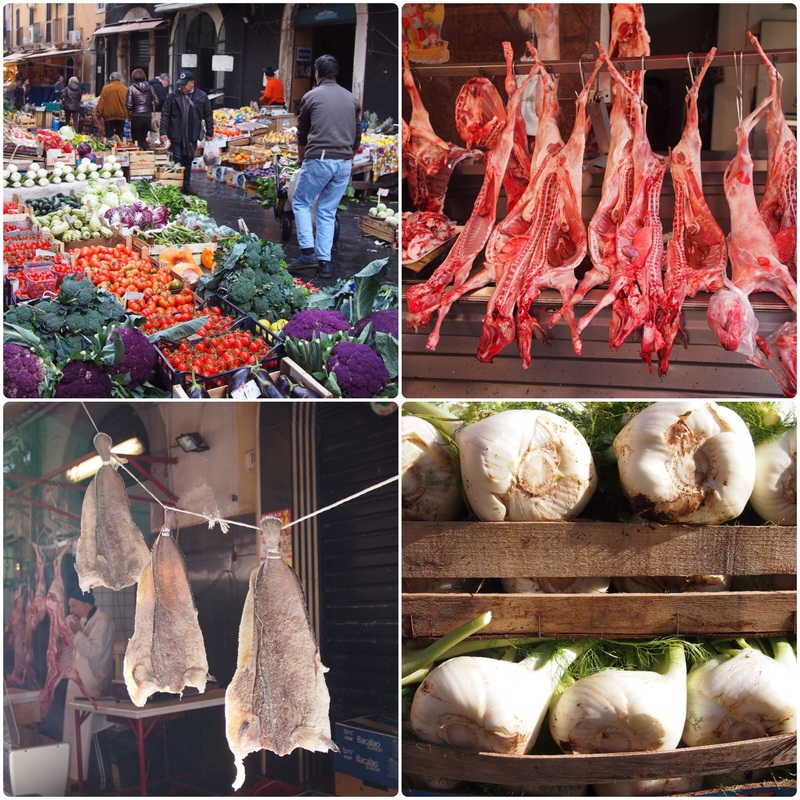 We found all of the vendors to be friendly and keen to show off their wares, some of which were unusual for us, such as dried salted cod, huge buckets of globe artichokes and lambs in the butchers shop sliced right down their middle, head included. The Fish Market was the closest of the daily markets to where we were staying. Fresh fish always makes an interesting display and the most eyecatching of the fish here were huge swordfish. The fishmongers display the head with attached ‘sword’ at the side of the stall, and slice juicy steaks from the body to order. 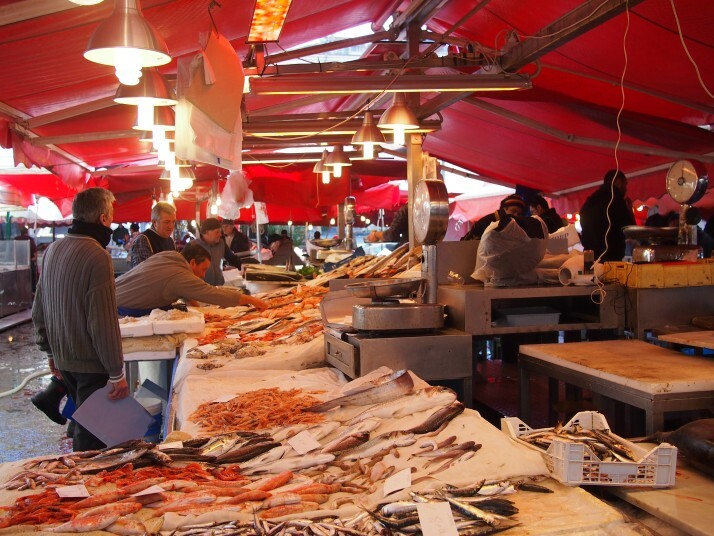 Wandering between the stalls were roving merchants of lemons and big bunches of parsley to complete the ingredients list for a simple fish supper. 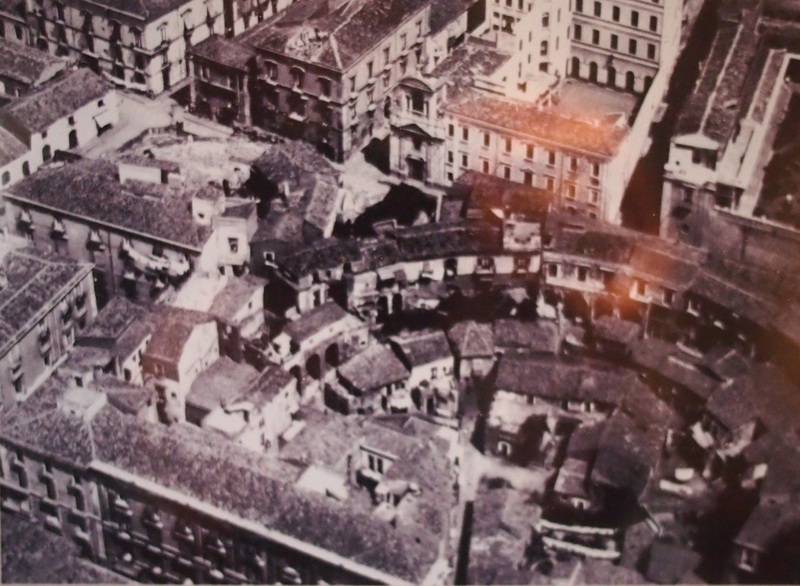 As well as the fish stalls, the surrounding streets had fruit and vegetable stalls, butchers, bakers and cheesemongers. Catania has a long history as a city and there are many historic sights. One of the oldest is the Teatro Romano, a semi-circular Roman theatre dating to the 2nd century AD which was built on the site of a Greek theatre from around 500-600 years earlier. 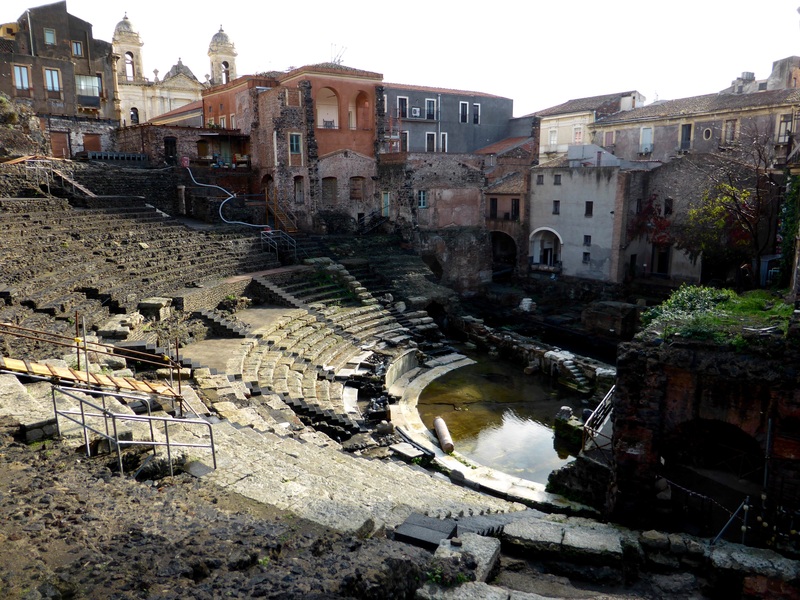 Roman theatres followed a similar design to Greek ones for good acoustics to host plays and musical recitals. The structure is impressive and must have looked striking when in its original form with white marble seating divided by eight stairways of black lava rock. As we paid for our tickets, the heavens opened complete with thunder and lightning so we sought refuge in the small onsite museum. There we learnt that until the mid 20th century houses were built on top of and all around the old theatre, incorporating its stonework into their structures. 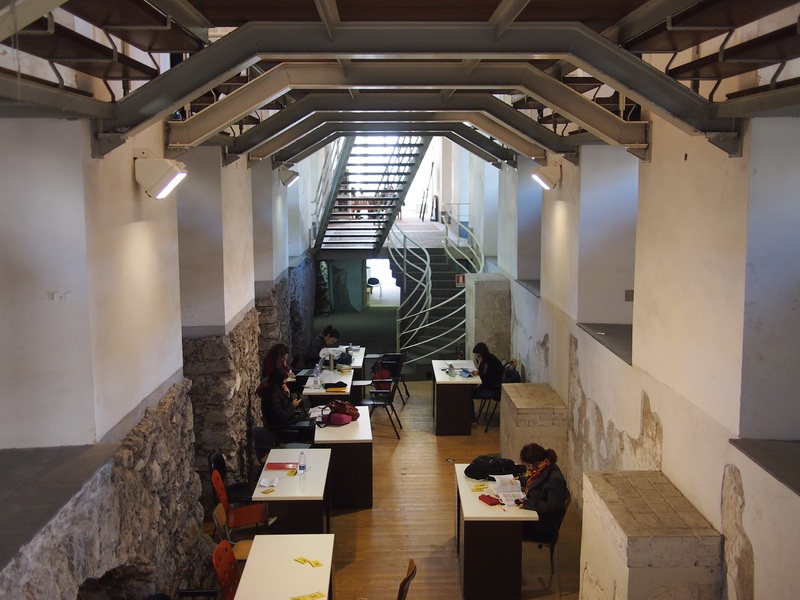 Since the 1950s, the Antiquities Office has undertaken several projects of excavation, removing the houses and restoring the theatre, and work is ongoing. The museum is housed in one of the encroaching buildings and has been preserved to show the way that the theatre was used through the ages. 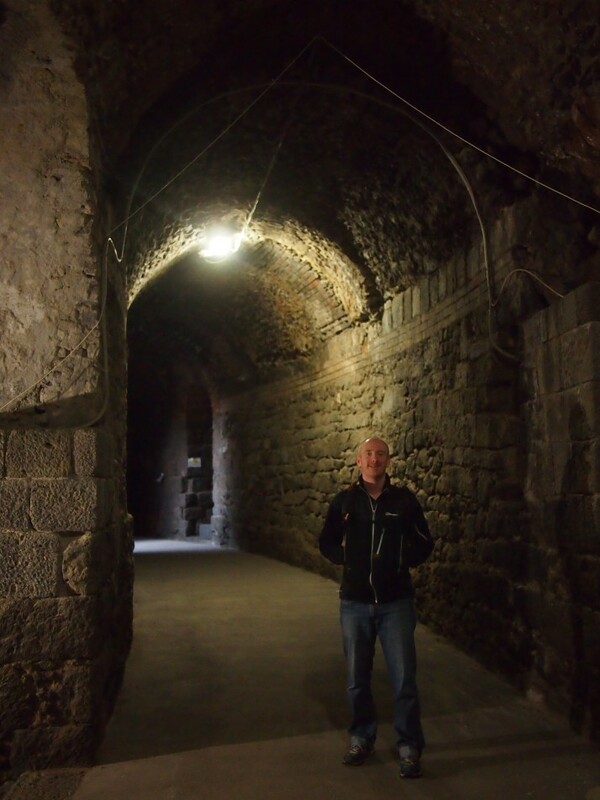 From there we explored the huge passageways which run beneath the seating before emerging into the theatre itself. 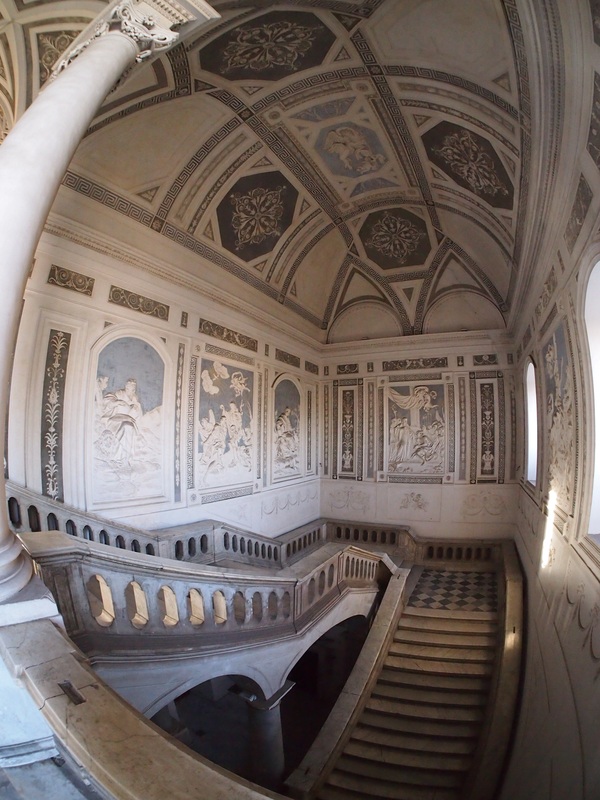 The former Benedictine monastery of San Nicolo is a fascinating building and we joined one of the hourly guided tours to gain access to some of its more interesting corners. I say we joined a tour, but we were the only ones on it and we had to read the information from a printout as our guide only spoke Italian! 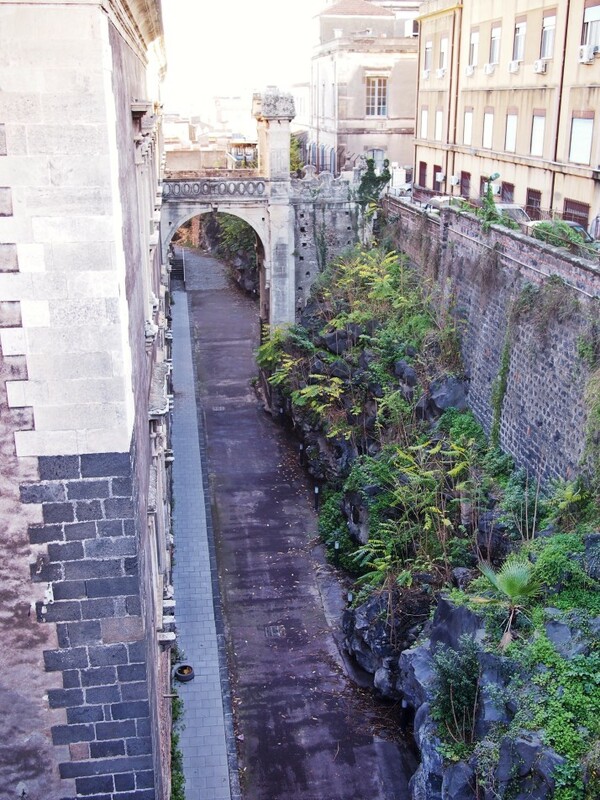 The monastery’s buildings were confiscated by the Italian state in 1866 and it is now home to the Humanities Department of the University of Catania. 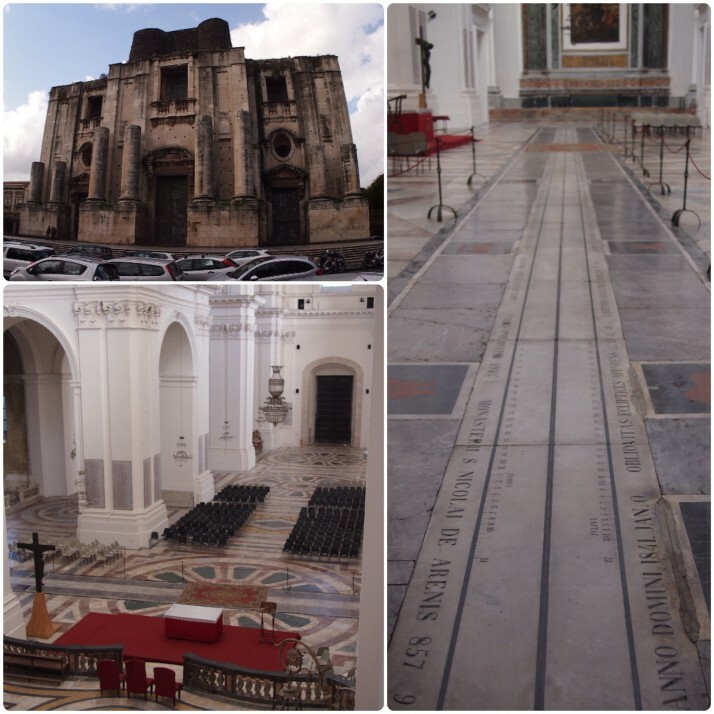 Before the tour we looked around San Nicolo church which is attached to the monastery. Its facade is unfinished and inside it is huge and whitewashed, seemingly not much used. The most interesting feature was the meridian line clock which runs for almost the full width of the church in front of the altar. These types of sundials were used to check the accuracy of calendars. In the second half of the 17th century, two natural disasters befell Catania. First, in 1669, a massive eruption of Mt Etna. We were amazed to learn that it took two months for the lava to travel the 40km to the city and so the monks had time to build a barricade around the monastery leaving it unharmed but with an immovable 12m high ‘shelf’ surrounding it to the north and east. Then in 1693 a massive earthquake flattened the monastery along with much of the city. The only part which survived was the basement which now houses the department’s library. 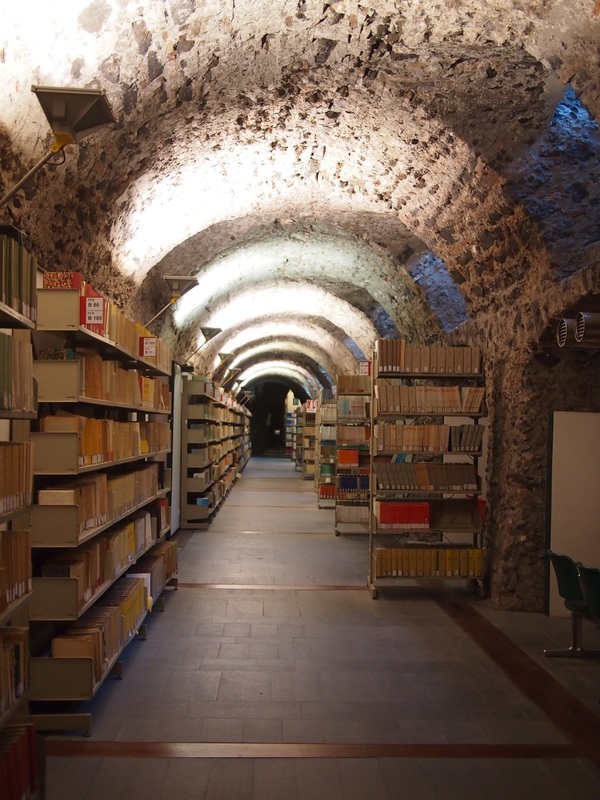 The Humanities Department’s library is located in the monastery’s basement – it would make a great location for a murder mystery! The second floor corridors are very grand with high ceilings and stone doorways, witness to the fact that most of the monks were younger sons from wealthy families and were used to luxurious surroundings. When the monastery was rebuilt after the earthquake, it was extended and, as the lava shelf could not be moved, the architect used it to support the new common areas of the monastery – the kitchens, dining hall, library and even a garden for the novices. Beneath the kitchen our guide led us through the vaults used for food storage. Andrew had found the route for a walking tour online and we enjoyed wandering the streets looking at the various monuments. Many were churches (about as densely sprinkled as the mosques in Istanbul), but we also saw the remains of a Roman amphitheatre (with seats all the way around as opposed to the semi-circular structure of the theatre), and a more modern theatre dedicated to Vincenzo Bellini who was born in Catania and whose tomb we saw in the Duomo. The final sight on the route was Castello Ursino, a medieval castle built between 1239-50 in a strategic position on a cliff next to the sea. Nowadays it’s a kilometre inland as later volcanic eruptions extended the coastline outwards! It is one of the few buildings to have survived the 1693 earthquake though. 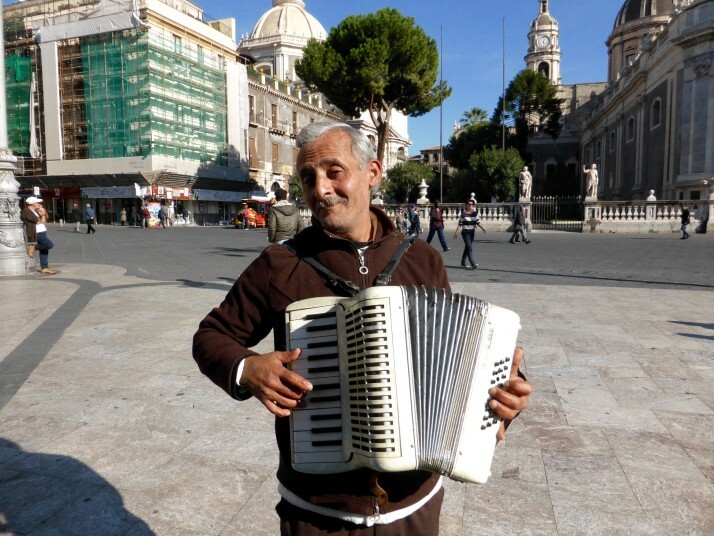 This entry was posted in Places and tagged Catania, Church, Italy, Market, Monastery, Sicily on December 23, 2014 by Julie.